If you work construction or renovation, you often need to straighten a twisted stud or joist. Tools such as Stanley’s Fubar will do the trick, but what if you don’t want to carry a separate tool to get the job done? 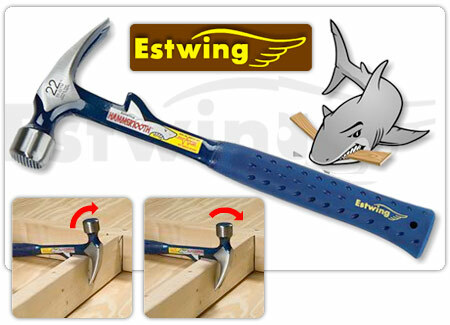 Estwing adds board-tweaking ability to a tool already in your hand: the hammer. The patented Hammertooth hammer can straighten any 2x board — just place the tooth and claw on either side of a board, and twist. Estwing forges the Hammertooth’s head and handle in one solid piece. The comfortable, durable, rubberized grip reduces vibrations caused by impact, and it’s molded right onto the handle. The hammer comes in two lengths: a 13-1/2″, 22 oz. version and a 16″, 24 oz. version. You can also choose from a milled or smooth face. That’s a good point. but I imagine that alot of professionals use a pneumatic nailer and still carry a hammer. You don’t want to carry an extra tool – i.e. Fubar – but you will need to carry an extra hammer. Doesn’t make sense to me! Have you ever worked in construction? I am a commercial electrician and still often carry a hammer with me… if you are on a job site a hammer is never an “extra tool”. It is used for most everything. Normally two or more people work together while building so there is no shortage of extra hammers or a hand also what is better that has a good handle that is balanced to use to straighten the timber and can be used as a hammer also. Multi function hammer is better than not a multi function hammer. It’s obvious to me some of you do not know the intended use of this hammer!This hammer is for serious framers in the business to get it done! This tool was intended to be used with a air nailer,not by itself. I have used this hammer for years and find more uses as I go. It works great on floor and wall framing as well as twisted trusses. If you seen this tool at work with a (air nailer ),I’m sure you would understand. Maybe it’s use was not clearly explained! The average joe putting up a tool shed not using air nailers will not see its benefit!